I discovered spoken word poetry when I was 17 years old. It was 2009. I was looking for a piece to perform for my speech communication class, and one of my classmates mentioned something about “DEF Poetry Jam”. Thanks to Google and YouTube, I eventually ended up finding “Hands”, a piece by Sarah Kay, which I performed nervously in front of my classmates. Since then, I have followed her and other slam poets’ performances every time I had the chance. If I need a pick me up, an inspiration, a get away vehicle from the world, I would shut everything out and turn my attention to spoken word. I never really became a performer, but I definitely became a fan. Although through the years, I lost in touch with this part of me, my love for words never left my heart. So imagine how excited I was when I found out about Phil and Sarah coming to Manila. It was a dream come true for so many reasons. And I know, I’m not the only one who felt that way. 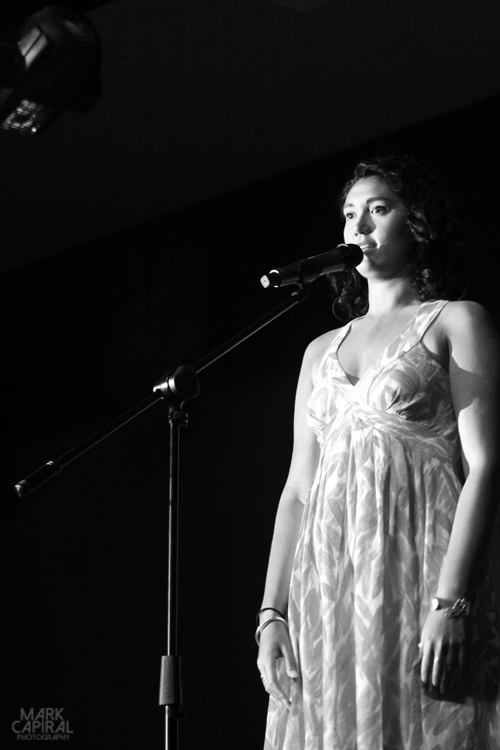 Spoken word poetry is a marriage between words and performance. Poets get a shot on performing their pieces, while using gestures, facial expressions, and possible interaction with an audience to create a stronger impact. It’s a form of story telling, plus word play, plus art, plus performance. 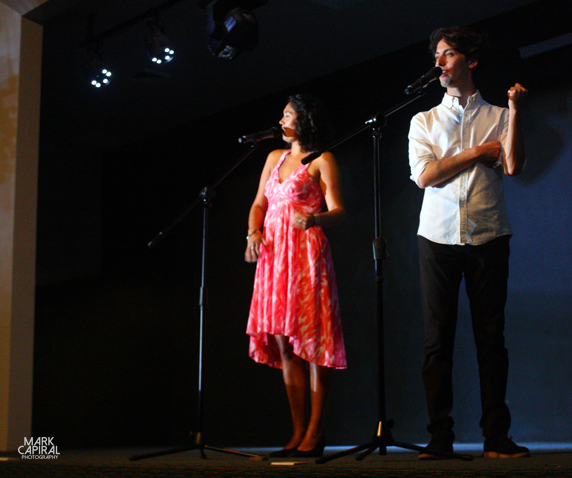 Phil and Sarah has been one of the most popular poets, and they have been invited all over the world, including TED talks, to perform their pieces. They are also the directors of Project VOICE (along with Franny Choi) where they bring in the gift of poetry to schools, and teach them valuable lessons that you can get from self-expression. 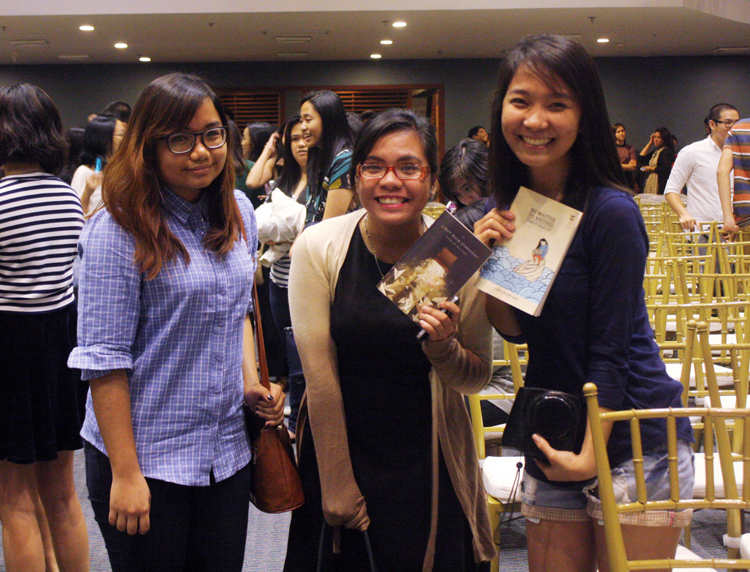 Never have I imagined that they will come to Manila, nor have I ever imagined that I would have the chance to watch them live, seat at the front row, take a photo with them, and manage to go home with a signed copy of their book. It was surreal and unbelievable. But before I get into my fan girl feels, let’s go back to how it all started. So, as some of you might know, I am actually a part of a start up company that provides custom apparel. I am handling the branding/marketing side (although my situation has been tough), but before things went crazy, I used to handle all sponsorship for our team. Needless to say, when I got in touch with Words Anonymous (they are the organizers of the event; they also do spoken word so check them out!) and they sent me a sponsorship letter for Project VOICE in Manila, I just quickly said YES. I know that’s mad, but I was able to rationalize my decision for pushing this through: (1) the event has our target audience (mostly students + high end market), and (2) this would add up to the diversity of our team roster. Anyhow, my boss said yes, and boom, instant complimentary tickets to the show. By the time that March came in, nobody from our team took the tickets. Obviously, I was the only one interested. So I took that chance, secured three tickets for their first show in Makati, and dragged Cza and Mark with me. When we got there, we were given our passes, and were asked to get inside the hall prior to the open house. We were comfortably seated at the front row, giving us a wonderful view of the performance, and the chance to actually run towards the merchandise area before anyone else. I also got the chance to take snaps of the performances, although I asked Mark to take more pics because I wanted to bask in the moment. Obviously, he did a pretty good job with the photos, even if he only did the shoot for about 15 minutes, tops. The performance started by 9:00 PM. I can tell that Sarah and Phil were overwhelmed by the extra rowdy fans, who kept on screaming whenever they go out on stage. They performed 3 duets and 3 solo performances each. I am so glad that I was able to see them perform my favorite pieces — B, Repetition, Origin Story, and When Love Arrives — which actually moved me a lot, making me almost cry. Needless to say, it was one of the best one hour of my life. After the show, fans were given the chance to take photos with the two. Since we were in the front seat, Cza and I were able to run towards the merch line within seconds. I was third in line. To be honest, I was trying to save a lot for my upcoming travels, but I wasn’t able to control myself from buying a book in exchange of a photo op, and well, I love books anyway. Since I was practically broke, I ended up buying only Phil’s book. 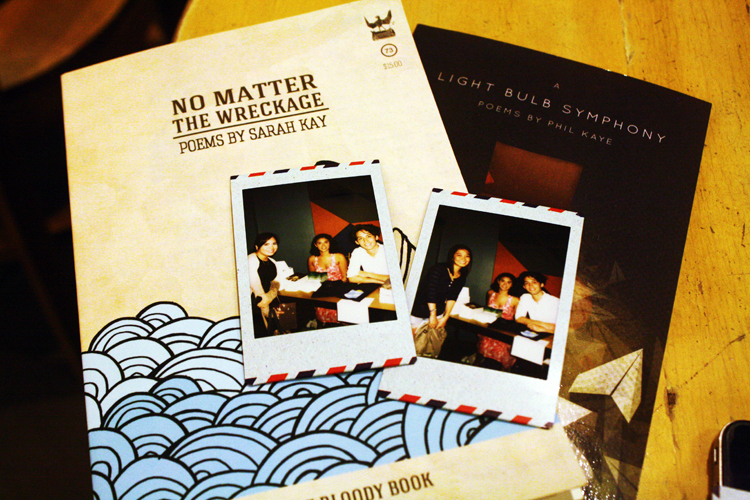 Cza bought Sarah’s — both of them are signed — and we agreed to exchange once we’re done reading. While I was in line, I was honestly thinking of what to say to them — I was thinking if I should tell them that I’ve been a fan since I was 17, or if I should tell them how much their pieces inspired me whenever I feel down. Unfortunately, when I was already in front of them, I ran out of words (something that I haven’t felt for years), and ended up being all awkward. We took a photo (which I won’t be posting because I am extra fat! Wrong angle! ), got my book, and went home. Ha ha! Although I didn’t have my moment with them, I eventually had my chance by their second show. My office mates and I had to drop by to do some work stuff documentation, and we got the chance to sit backstage, and see how Sarah and Phil are so hands on with everything. From the sound check, to the lights, to the merchandise table, everything is being checked by the two of them, which is really sweet, I must say. Anyway, Phil said “hi” (WE HAD EYE CONTACT) to me when I was randomly seating backstage, and it was the longest three seconds of my life. All in all, the experience is just amazing. Phil and Sarah has been, in a way, my heroes — they are my idols, and they have given me numerous inspirations while I was painstakingly trying to pass my poetry and speech comm subjects. Although I will never be a great poet like they are, I am more than happy just to hear their words talk to my heart. I wish that they’ll go back in Manila, and fill our hearts with beautiful words and stories again. On another note, I think my love for poetry (spoken word + print) is back. I may or may not binge download/shop for new poetry books soon. My soul is filled with love and happiness. Until next time, Phil and Sarah. omg!!! i remember discovering them before and watching/listening to some of their "performances"! so addicting and moving and strong!!! so cool! EEEK! I can't believe you met them! I've watched their videos on youtube and they are spectacular! I've watched When Love Arrives online, and it gives me all the feelings. Ugh, I envy you so much! This is so cool and exciting!! Wow! I'm a sucker for poetry Jhanz. The same with theater and musicals so I'm sure this one's my cup of tea. I wish they'd come to Cebu as well! I bet this amazing. I love spoken poetry. I used to be part of a online group that used to read each other our poetry over audio chat haha! poetry has been a part of my life since I was a kid. I write poetry but I haven't experienced spoken poetry yet. What a wonderful post! I've never heard spoken poetry performed in person before, but this really makes me want to check it out. It seems like such an interesting and unique experience, I'd love to try it. I am SO interested in poetry and poems. I write my own and I love to discover artists who are doing it on big screen. Both Sarah and Phil (I'm googling them right now, ha ha!) seem to be inspiring people. What a great chance to meet them in person! I love to go such event like this. Congrats on finally meeting them! A dream come true indeed. 🙂 I really adore poetry. Unfortunately, I'm not really into it. This looks like it was a really fun event! Have a nice day, Jhanz! Yay glad to know! You should check them out! Haha! 🙂 You should check out their performances. They are really good!!! How I wish I could've been a part of their workshop! But seeing them live is enough. hehe <3 They really are an inspiration!